We have been successful in finding invoice finance for a number of companies operating within the UK care sector. Often the provision of care workers is funded by local authorities, but there can be delays in receiving payments for services already rendered. See our free credit control guide for tips about chasing local authority debts. We have introduced many care staff providers to invoice finance companies that can release the cash from those invoices immediately. This can be used for any purpose including paying staff. According to the Government’s site, the UK care home sector is worth some £15.9 billion a year, with 410,000 residents. The Office for National Statistics predicts a 36% increase in the number of people aged 85+, between 2015 and 2025. Care managers such as team leaders, supervisors and managers. Ancillary roles such as cooks and kitchen workers, housekeepers and domestic staff, drivers and maintenance workers. In addition to the elderly, other related care sectors, such as those caring for people with disabilities, or mental health issues, and those providing domiciliary care have also seen growth and can experience similar cash flow problems. All staff recruitment and placement, where billing is to corporate or Government entities on credit terms, is normally eligible for funding, whether it is temporary or permanent placement of workers. 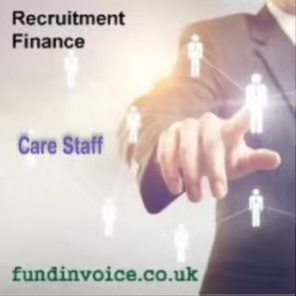 Call Sean on 03330 113622 if you might benefit from care sector invoice funding.